Screenshot. 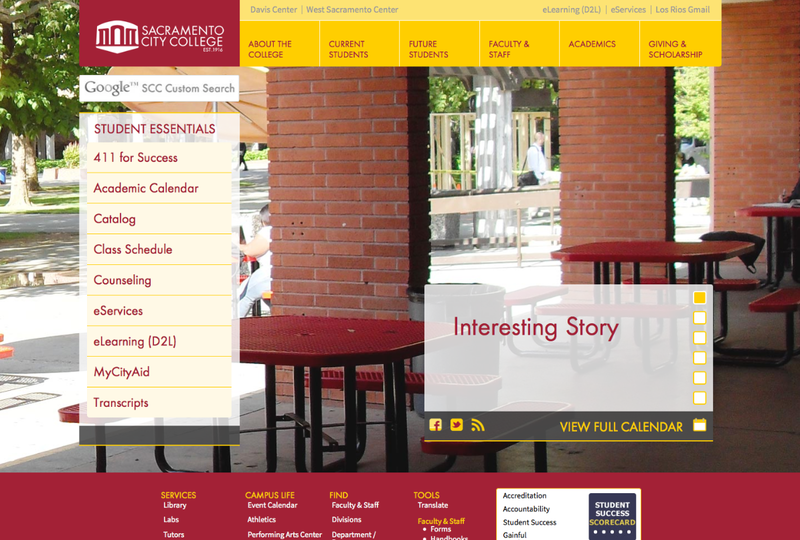 City College’s new website will feature a more organized layout and a dynamic home page, which will display news stories and important campus information. A team of faculty, staff and students at City College has been working since the fall of 2012 to deliver a new and improved version of the scc.losrios.edu website during the spring 2014 semester, said graphic communication professor and integral team member Don Button. The new site will be responsive, among other many changes and upgrades, meaning that when it is opened on a mobile device, the site will resize itself to the user’s screen size, said Button. Button, who worked on the site over the summer and is on sabbatical this semester while finishing it, said the biggest challenge is trying to find enough time to get everything accomplished. The main focus of the redesign was to make the site easier to use for students in response to a recommendation by the accreditation committee, according to Amanda Davis, City College public information officer. Button explained that the original goal was to launch the new site in January, but because of a recent accreditation deadline change and concerns about launching during a busy time for site traffic, the site is now slated to launch in March. “We realized switching the site right as the new semester was starting, when people might still be registering for classes and such, would probably cause more disruption than we thought initially,” said Button. Along with Davis and Button, the team consisted of Quinn Nakano, reprographics programmer; Elaine Ader, dean of information technology, and Aaron Winters, adjunct graphic communication professor. The team planned and designed the look and features of the new site with the help of former City College graphic communication student Chris Hopkins. Hopkins said he was asked to join the committee by Tom Cappelletti, City College graphic communication professor. During the design process, Hopkins worked with Button and Winters to map the current site, identify what content should be carried over and what was unnecessary. In spring 2013, after the site was mapped and the final design was chosen, work on the site began. Button explained that the choice to use the WordPress platform, which, according to Wikipedia, is a “free and open source blogging tool and content management system,” was made because of its universal ease of use. Button added that part of the overall project is to help train the people who will be responsible for updating their individual content in each department. The site was designed to make this process as painless as possible, he said. “We’ve got a set of templates, and so there’s not a lot of room for individual creativity within the site, but we’re sort of focusing on keeping the visual presentation sort of clean and unified throughout all the sites,” said Button. The reason for making the site more uniform is because the current site has a lack of continuity among the departments, according to Button. Button said that the key has been working with the departments about how their content is organized. According to Winters, though he isn’t currently working on the site, his main concern in the beginning was to create a layered feel to the information on the new site. Ader agreed that the new website will make the process of finding content smoother for users. “We wanted to make sure the available information was easier to find,” said Ader. Other new features will include a refined and more accurate search function, a redesigned library site, a universal calendar system and a home page that will highlight news and important campus information, Button said. A focus going forward, according to Davis, will be to assemble focus groups to test the new site and collect feedback in order to continue refining the user experience. Davis added that it’s important to stay current with industry standards in terms of what is user-friendly. This entry was posted in News, Sac City Express (SCC) and tagged Chris Hopkins, daniel wilson, Don Button, Elaine Ader, heirarchy, new wesbite, Sac City College, Sac City Express (SCC), SCC. Bookmark the permalink.